You asked for it, and now Quora has answered. The popular Q-and-A service today released an iPad app for all your browsing, asking and answering needs. “We think that this might be the best reading platform that we’ve made available to our users so far,” Quora Business and Community head Marc Bodnick said in an interview. Given that Quora content tends to be longer than most other social networks, it’s a wonder that the company hadn’t released an iPad app already. 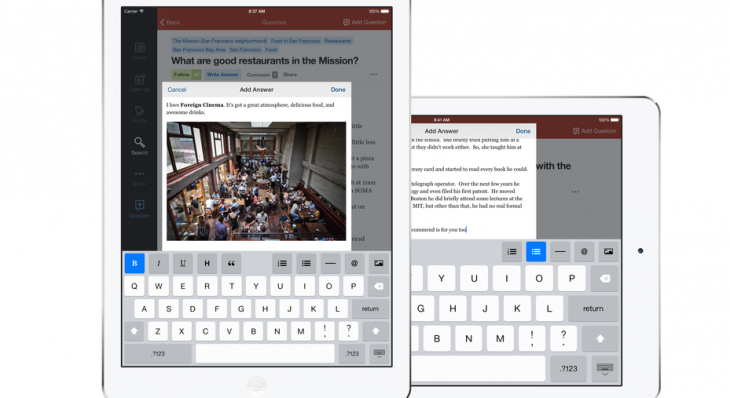 Along with today’s iPad app launch, Quora has given its service-wide rich-text editor a new look. Quora rolled out a redesign across the Web and its Android app earlier this summer, so the iPad expansion wraps up its efforts to reach a unified design for the entire service. Quora CEO Adam D’angelo wrote in a post that having a consistent experience across its platform will help the team move more quickly to add top-requested features. Quora has also revealed new growth numbers for the year. The company has tripled the number of answers written per week since the start of this year. It also expects to add more new answers in the next 12 months than in the past four years combined.